An MPF hot-wire anemometer also had calibration problems. Such technology is sensitive to pressure, gas composition, air temperature, and their own overheating which may induce systematic errors (Pedrero, Jaime, 2010)68, and, in fact, in May, 2013 Ashima Research and apparently the REMS Team both caved in to our demands to Guy Webster that they replace all winds published with Not Available since they were clearly erroneous at a never changing speed and direction of 2 m/s (7.2 km/h) from the east for 9 months - especially given that Boom 1 broke on landing (see Figure 15A). Schofield et al. (1997)67 indicate that while Pathfinder was operational from July 4 to September 27, 1997, it had no pressure data for the most crucial sol – its first operational day on Mars. The reason given by the above reference is there were “various spacecraft software reset and downlink problems.” If the problems only occurred after the first day; and if the first day’s pressure data was consistent with the Vikings, then Pathfinder’s data could be used to refute the claims made herein. However, that is not the case. We are still dealing with a Tavis transducer with no way to keep the dust out of its pressure air access tube on or in the seconds before landing, and no way to change a clogged dust filter. The critical time is in the final landing process. So when the spacecraft has to reset the software and correct downlink problems then, the issue of exactly what is entailed in these corrections becomes one of extreme importance. It should be noted that for MSL all data originally listed for sols 1 to 9 was also deleted by JPL. 7.1. Anemometer/Telltale Wind Speed Issues. Figure 27 � Phoenix telltale waving in Martian wind. Out-of-phase image may indicate a dust devil occurrence. Images taken before & after the event have west winds estimated at 7 m/s. During the event south winds are estimated at 11 m/s. Adapted from Taylor et al., 2008. Their paper states, “We had hoped to include an anemometer in the MET package. Faced with a lack of resources to achieve this, and the real desire to have some wind information we decided to make use of the SSI camera and have a novel Telltale to achieve this.” See Figure 27. 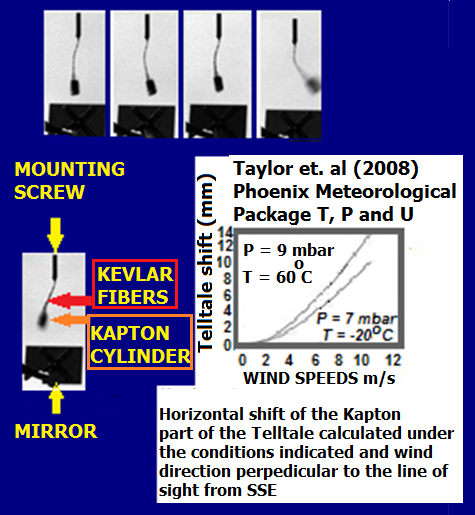 The above Taylor paper rated the Telltale as capable of measuring wind speed in two orthogonal directions normal to gravity in the range of 2 to 5 m/s with an accuracy of 1 m/s or 20%, whichever is greater; and in the range of 5 to 10 m/s with only 40% accuracy. What happens when wind speed exceeded 10 m/s? The Telltale reaches maximum deflection, goes horizontal, and “loses its wind speed/deflection correlation ability.” This means that it is worthless in determining how strong winds are that exceed 22.4 miles per hour. Again, Stanzel et al. (2008)17 report dust devil velocities as high as 59 m/s (132 mph) seen by Mars Express Orbiter. The MPF IMP windsock was ineffective because light wind (< 5m/s) dominated the mission. Calibration for this windsock was only at 1,015 mbar and ~15 mbar of terrestrial air – see Annex H. Higher surface pressures for Mars were apparently not considered. The 15 mbar figure factored in molecular weight differences between our air and CO2. It states that wind-tunnel experiments have shown that a patch of sand would require winds of about 80 miles/hour (128.7 km /hour) to move on Mars compared with only 10 mph (16 km/hour) on Earth. It then makes the understatement that measurements from the Viking landers, in addition to climate models, showed such winds should be rare on Mars. The word rare was too generous. For Viking 2 during sols 1 to 199 the maximum wind recorded was 35.57 km/hour mph. From sols 200 and 399 it was a good bit windier, but the maximum winds at 83.5 km/hr – were still short of the 128.7 km/hour figure required to move the sands. Average wind for Viking 2 was about 12.13 km/hr from sols 1 to 199; and 21.45 km/hr from sols 200 to 399. Table 13 – Profile of the windiest Viking day on Mars with the greatest wind gust recorded. A response to the resolution suggestion is that, as is noted before in conjunction with the 8,331 wind velocity measurements recorded at Viking 1 and Viking 2, in no case was a gust ever caught that hit 80 mph. The windiest day seen was with Viking 1 with a 57.9 mph gust during its sol 214.78 when the planet was at Ls 210.872 (Martian fall in the northern hemisphere). Did this gust come out of a sudden event like a dust devil? No, obviously it was a storm of some sort, because the winds began to rise in the morning that day at sol fragment 214.38, then the fell off toward Martian midnight. Based on data from Professor Tillman's Viking Project Site, the incident is shown growing and subsiding on Table 13. Bridges et al. note that dunes and ripples (collectively termed bedforms) are abundant and widespread on Mars, with concentrations surrounding the north polar layered deposits, within craters and other depressions that trap sediment, and as isolated patches on the plains. The area surrounding the north polar layered deposits includes some of the lowest elevations on Mars. Low elevation implies higher pressure, which means that it becomes easier for the winds to move sand, but the assumed increase in pressure at the altitudes in question are still insufficient to move the sands on a widespread basis. Even at Lyot (7.036 km below areoid), the lowest point in the northern hemisphere, we would only expect pressure to peak at about 11.7 mbar if there is 6.1 mbar at areoid (See Table 1 earlier in this report). Bridges et al. notes that comparing the movement map to predictions of the Ames General Circulation Model (GCM) (Haberle et al., 2003)72, shows no correlation to the high wind frequency regions. They believe this demonstrates that the models do not resolve small-scale topographic, katabatic winds (as occur in the north polar region; Ewing et al., 2010), and general boundary layer turbulence that may cause gusts above threshold (Fenton and Michaels, 2010). However, the GCMs are based on the assumption that the average pressure at Mars areoid is only 6.1 mbar. If the movement maps do not resemble the GCM predictions, then this again may support our contention that the ultralow pressure is incorrect. The gusts above the 80 mph threshold were not seen in the 8,331 measurements that we checked from Vikings 1 and 2. FIGURE 30: Erasure of Spirit�s tracks during the 2007 global dust storm between its sol 1250 and sol 1272. Credit: NASA/JPL, courtesy of Geissler, et al/JGU. An example of tracks being erased is shown in Figure 30 where Spirit’s tracks vanished during the 2007 global dust storm. Spirit landed ~1.9 km below areoid. If the average pressure at areoid is about 6.1 mbar, with a scale height of 10.8 km, the average pressure at -1.9 km should only be about 7.27 mbar – quite low if wind is expected to move the sand. Unfortunately the rover carried no meteorological instruments. This means that it could not measure pressure or wind. However we can compare the time that it felt the dust storm to the time that Viking 1 experienced its two global dust storms in 1977 (see Figure 31). We could also look at what happened to Viking 2 then, but both MER Spirit and Viking 1 were in the Martian tropics while Viking 2 was at almost 48° North. As such, it is appropriate to examine the winds experienced by Viking 1 during dust storm 1977a, which began at Ls ~205, and dust storm 1977b which started at ~Ls 275 (see Figure 31). Note – both Vikings landed at an altitude about 3.6 to 4.5 km below the areoid. Identical winds at the much higher Spirit would be less able to move sand. We reviewed the hourly winds for 20 sols after each of these Ls (Solar Longitude) positions in the Martian orbit, where Ls 0 = the start of spring (in the northern hemisphere where Viking 1 landed), Ls 90 = the start of summer, Ls 180 = the start of fall, and Ls 270 = the start of winter. In skimming through the data it appears that in the 20 sols that began at Ls 205, the maximum wind at Viking 1 was 25.9 m/s (57.93 mph - see Figure 28 above), but this velocity did not occur until Ls 210.872. For the second dust storm the maximum wind was 18.3 m/s (40.9 mph). Note: For Global Dust Storm 1977a the first hourly wind for Viking 1, Ls 205 was reached by coincidence at its Sol 205. The initial hourly wind examined was at Ls 205.017 at Sol 205.38. Hourly winds were then tracked through its Sol 224.98. This occurred at Ls 217.301. For Global Dust Storm 1977b the first hourly wind examined for Viking 1 was at Ls 275.005 at its Sol 314.14. Hourly winds were then tracked through its Sol 333.98. This occurred at Ls 287.385. So even during Global Dust Storms 1977a and 1977b, there was not enough wind to move sand at the accepted pressure. From January 23 to 24, 2017 sand was observing to be moving under Curiosity. See the video at https://photojournal.jpl.nasa.gov/archive/PIA21143.gif. Figure 30 � Dust Storms and pressures recorded at Vikings 1 and 2. This figure is adapted from the Viking Computer Facility, University of Washington. Bridges et al. offer guidance about the relationship between pressure and threshold speeds. In a discussion about obliquities (planetary axis tilt) greater than the present 25° to 50°, they mention that at pressures of 10–15 mbar compared to the current ~6 mbar the threshold friction speed is approximately inversely proportional to the square root of atmospheric density, such pressure increases will reduce threshold friction speeds by 30%-60%. During Viking 1's sols 1 to 350 the maximum wind velocity recorded was 57.9 mph. For Viking 2 between its sols 1 to 399 its maximum wind was 51.9 mph. If the surface pressure is actually 10 to 15 mbar, and threshold speeds are reduced from 80 mph to 30% or 60% less, then these speeds become something between 56 mph (with a 30% reduction) and 24 mph (with a 60% reduction. The 24 mph speed is entirely consistent with velocities plotted on Figures 28 and 29 above. The highest wind recorded for Viking 1 also exceeds the 56 mph requirement. Therefore, the winds seen at Vikings 1 and 2 are consistent with moving sand at pressures of at least 10 and 15 mbar. The frequently shifting sands could, of course, also be consistent with higher pressures. The 8,331 wind measurements are not at all consistent with a pressure of 6.1 mbar. Bridges et al. conclude that "...these results show that winds in the present low-density atmosphere of Mars are sufficient to move dunes and ripples in many areas of the planet. A major climatic change with a thicker atmosphere is not required." We think that the last sentence needs to be lengthened a bit. The full sentence should read, "A major climatic change with a thicker atmosphere is not required because the thicker atmosphere already exists now." This report is continued at Mars Report 8.